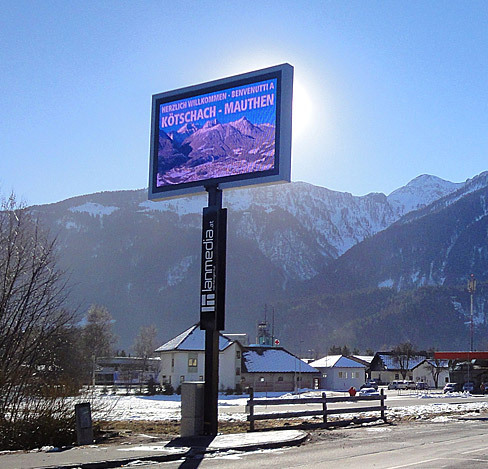 Outdoor Digital Billboard & Video Display, using advanced LED technologies, with high brightness, high contrast, high grayscale, high refresh rate, high definition resolution, and with the ability to customize various sizes and various length-to-width ratio, is becoming the current outdoor star display products. It has a high degree of visual impact and influence, and is an important component of outdoor media, mainly installed on the outer walls of commercial centers, on the building roofs, by the main roads, highways, stadiums, plazas, parks and school gates, to display advertisements, information, announcements, video programs, and advertising videos. ― Provide integrated solution & customized solution for personalized requirements. ― Own-developed CSTCloud system, achieve to control the display anytime and anywhere. ― With top-quality, super-bright LEDs, high uniformity, low color shift and high reliability. ― High brightness, high grayscale and high refresh rate. ― Module-by-module brightness calibration technology is used to individually adjust the spare module`s brightness when maintenance to ensure good uniformity. ― Low voltage driven, energy saving. ― Modular design for flexible display configuration. ― Front access or rear access maintenance, easy service. leaving enough margin to ensure long-term stability and reliability. impact on the cabinet; use an optimized design of fan-forced cooling system to accelerate the heat dissipation inside the cabinet. So as to reduce the temperature rise of the display, improve the reliability, and reduce the light decay of the LED. ― With N+1 power supply backup, when the power supply fails, the backup power supply will seamlessly take over and notify the control center. the data can still remain ongoing transmission and avoid displaying interruption thanks to the bi-directional transmission technology. ― Intelligent power distribution function: step-by-step power up, reducing the impact on the power network. ― Intelligent full monitoring capability (optional): monitor the door status, power supply, fan, dust filter, temperature, etc. ― Intelligent brightness adjustment function: energy saving and prevent light pollution. ― Powerful software for traffic information management knows everything about the running status of the display. even if the operator is not at the control center, he can also know the running status of the display in time. ― Intelligent alarm function: You can preset the temperature value for the alarm, brightness down, display off and power off inside the cabinet. The display will carry out the corresponding actions according to the monitored temperature value. brightness down, display off and power off, timely proceed the high temperature protection to ensure the safety for the display and prevent the occurrence of fire. ― Intelligent brightness adjustment function: prevent light pollution. to ensure the display operation of high security and accuracy. SMD: 4mm, 6mm, 8mm, 10mm,etc. Network cable, optical fiber cable, WiFi, 4G, etc. Die-casting aluminum, Fabricated steel or aluminum or customized. Installation Method Hanging, mounting, against the wall installation. Remark: According to different configurations, the above functions and parameters will change. For any detailed or customized solution, please do feel free to contact us directly (sales@comsight.cn).